Making jewelry is my passion; the unrefined shapes and colors of our natural world inspire my lines. I've been developing this craft for the last 5 years and through hard work and dedications have produced quality and affordable wearable art. My jewelry is completely hand formed and I employ jewelry grade brass and silver combinations. I love working with Brass due to the malleability and warm tones that gleam and resembles gold. I often challenge myself to explore unique textural and sculptural techniques. The work is textured and shaped with hammers and various forming tools and each piece is one of a kind. I was only eight years old, during the American Bicentennial year, when I came across an old, faded clapboard shed just south of Waitsfield village in Central Vermont. Centered in that room on the dirt floor was a small glass-melting furnace, roaring brilliantly orange. It was incredibly hot. It hurt to look directly into the flame but that's what I did, fascinated by the power and majesty of glass. This was the domain of two local glassblowers, and their world of manipulating glass, one of the oldest and most basic craft materials. Thirty-two years later, I am manipulating glass to manifest my creative vision. 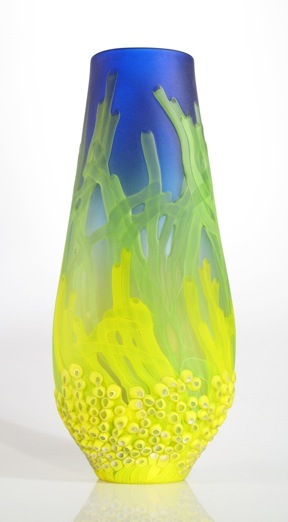 With only a few basic elements, silica sand, soda ash, and limestone, I use intense heat to melt a clear base glass, which I then weave into a tapestry of art and objects from the simplest vase to the most complex sculpture. "The signature elements of my collection are design motifs such as bamboo, fan shapes, and natural forms. I find inspiration in Chinese folding screens, paintings, and hanging scrolls. In my practice of ikebana, the Japanese art of flower arranging, I have developed a respect and appreciation for Asian aesthetics. In my work, this translates to using the contrast of line and shape, raised form elements and recessed engraved detail, the play of light, and the use of empty space as important components in my work. My designs focus on asymmetry, odd-number combinations of visual elements, and subtle details. I view my designs as fine art and not simply fashion accessories. The flow of one earring design to the next is important, like a story across space, where we become a part of that conversation." Anjanette lives and works in the Heart of the Green Mountains, Rochester, VT.
David has been working in glass for the past 25 years. Professional awards include a Fulbright Award to Sweden, a Creative Glass Center of America Fellowship, and two New Jersey Council for the Arts Awards (including the distinguished artist award). Museum Collections of his work inculde the Renwick Gallery (Smithsonian), New Orleans Museum of Art, Museum of American Glass, and the Musee Des Artes Decoratif (Lausanne). 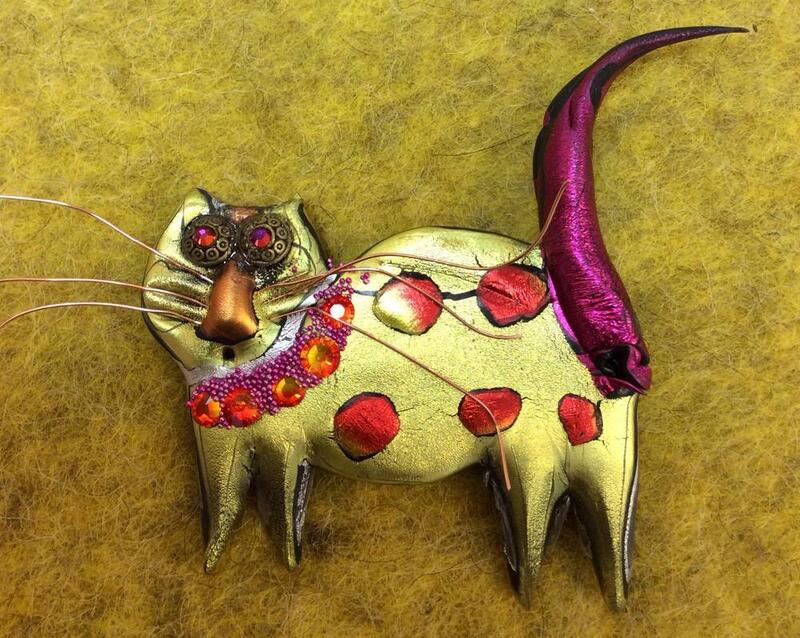 Beth E McDowell is an eclectic artist, metalsmith and lover of all things crafty. Born and raised in an old farmhouse in Huntington Vermont her love of art was evident from a young age. Not having access to traditional art supplies, she made do with what she had and continues to do so today. 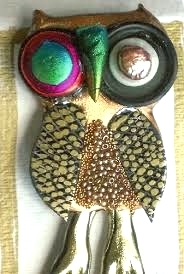 Focusing on using recycled materials she transforms the ordinary into extraordinary works of art. After taking one silversmithing class Beth’s love of metalsmithing took off. Her work showcases her love of nature and whimsy. 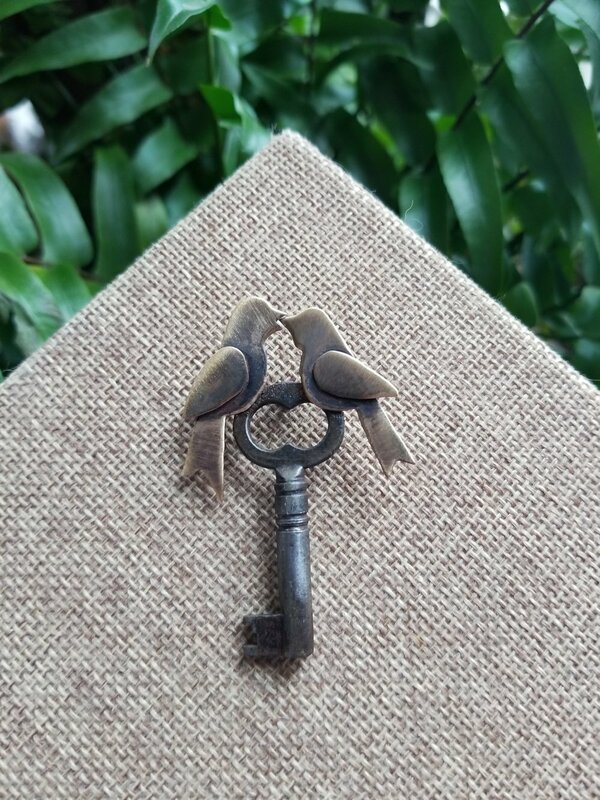 Using silver spoons, pennies and other reclaimed metal objects, Beth creates jewelry for those who have a story to tell. Today she lives in Colchester Vermont and has a small studio in her home where she designs and makes unique jewelry creations. She happily invites everyone to enter her world where imagination comes alive. Hailing from Huntingdon, Pennsylvania, Samantha Lightner is currently chasing hot glass and the great outdoors here in Vermont. Her journey with the molten medium began in 2010 at Wheaton Arts and Cultural Center, and she has since been immersed in the world of glass. From sake sets, to rocking boat glasses, and unique barware. Sam is redefining what everyday glasses and tumblers should look like with her fun, functional art. Custom pieces and colorways available upon request. Charlotte Potter is an artist who lives in Fayston Vermont and comes from a family of seekers, makers and designers. She received a BFA from Alfred University in 2003 and an MFA from the Rhode Island School of Design in 2010. Charlotte Potter Designs (CPD) was founded in 2006 while Charlotte was teaching glass fusing at the Art Association in Jackson Hole, Wyoming. Noticing the large amount of usable scraps from student’s projects, Charlotte began saving and producing glass earrings with sterling silver wires out of the small leftovers. She uses her attune aesthetic eye to marry clean design with bold colors to create this body of work for the everyday and everyone. Charlotte Potter Designs is available in locations nationwide and each pair of earrings is completely hand crafted and assembled by dedicated and skilled makers. When I began making art, metals were my medium of choice. After learning to work with stained glass, employing the copper foil method of construction, I began incorporating metals into my work. 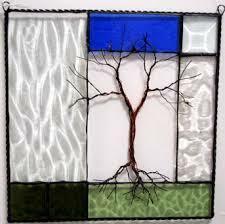 Drawing on inspiration from the natural world lead me to create trees from copper wire and incorporate those into very geometric and simple stained glass pieces. I am able to create bold and unique pieces using the enormous array of colors and textures found in stained glass. dichroic glass with its gorgeous colors, but will be quickly amazed of its sleek size and feather-weight. These earrings are fun and unique, and a great way to pull colors together in your outfits. Some of my earliest memories are of heading out into the woods and fields with a magnifying glass and a sack lunch. I spent days fascinated by discoveries of the micro world. Today I’m drawn into my work in a similar way. I love the challenge of creating a piece that 'works' from a distance as well as up close; ideally rewarding the viewer who takes a closer look. My medium of choice is polymer clay. With its wide color palate and ability to create fine detail, I believe we are well matched. My work is the embodiment of my childhood in Vermont and a testament to the prized possession of jewelry. The Northeast landscape where I was raised informs my color palette of blue and green stones, as well as my line-centric designs. Both the rivers and the mountains of Vermont create a vast variety of topography, these geographical formations weave throughout my home, and I’ve taken what I’ve found to be the most inspiring aspects of these landscapes and have incorporated them into my work. From a young age, I was aware that my mother’s jewelry had an incredible amount of sentimental value to her. Because of that, it has always felt natural to me to emotionally invest myself in the jewelry I chose to wear, to allow myself to form an attachment with each piece and what it stood for. I believe that over time what we adorn ourselves with becomes a part of who we are and our self-identity, it joins us in our journey through life and becomes a reflection of the passing years. Tossy's own designs are inspired by antique and traditional jewelry from around the world, natural forms, and a contemporary sensibility. She has trained in Florence, Italy at the Fuji Studios, and in the States with Kate Wolf, Blaine Lewis, Dan Grandi, and others. Her travels to Italy, Turkey, Ireland, and India have provided amazing inspirations for her designs. 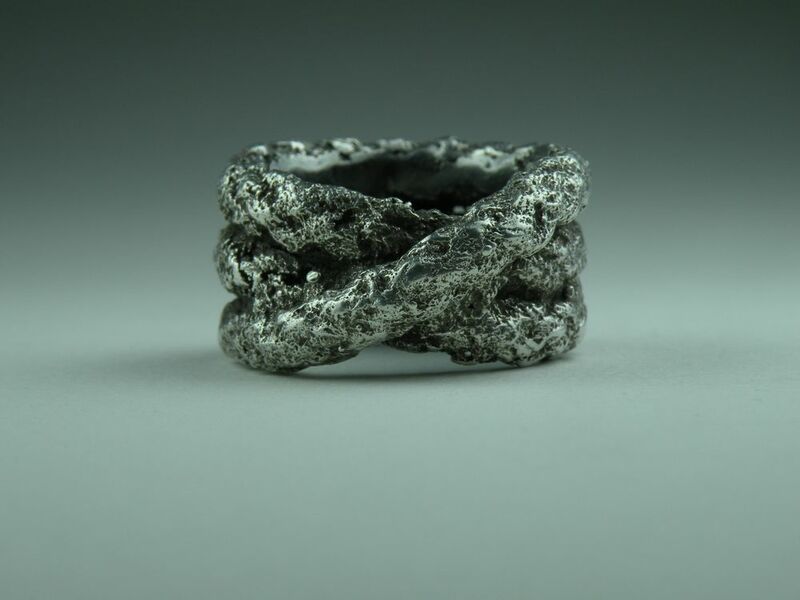 Tossy's chosen medium for creating her jewelry is wax carving.&nbsp; A sculptural form is carved out of jeweler's wax and after making a mold the form is cast in silver, gold, or platinum. Original jewelry designs inspired from Alix's travels and awareness of stewardship for our planet. 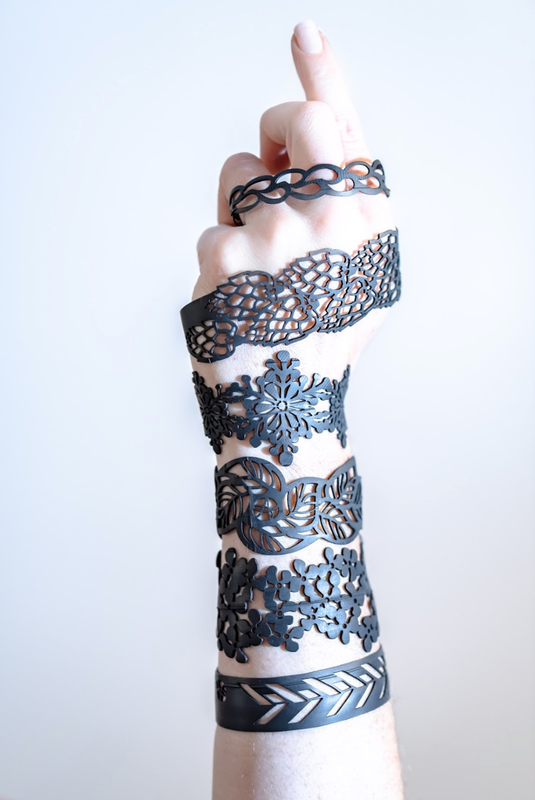 Her focus is to create stunning jewelry while reducing, reusing, and recycling materials such as up-cycled bicycle inner tubes. The use of base metals and silver is another style that is handcrafted and available online. Alix's skills were honed in at Pratt Institute and refined through her teaching experience and ongoing artwork. 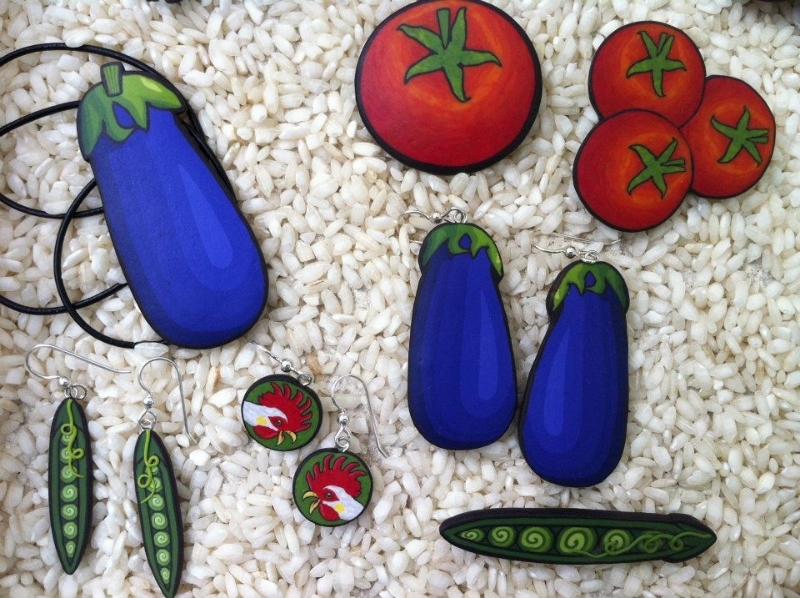 Lori Klein is a Vermont artist specializing in one-of-a-kind jewelry pieces and custom handcrafted jewelry design work. Lori uses sterling silver, gold and vermeil findings with semi-precious stones including turquoise, lapis lazuli, chalcedony, onyx, tourmaline, quartz; freshwater pearls including branch pearls, coin pearls, keshi and seed pearls; coral, amber, wood, shells, glass and Swarovski Crystal. Whimsical and fun jewelry, endlessly creative. Stacie Mincher grew up in Middlebury, Vermont where she thrived artistically with unlimited access to her Mom’s stenciling paints, vintage button tins, and fabric collections. Always encouraged to pursue her creative interests in school, she found that art was her favorite and most successful subject. She later attended Castleton State College and graduated in 2000 with a Bachelor’s degree in Fine Art. Stacie is best known for her designs utilizing recycled zippers, which she organizes into interesting patterns to create beautiful and unique brooches, pendants, hair barrettes, and earrings. She has been known to cover the faces of clocks, lids of wooden boxes, frames, and Christmas tree ornaments with zippers. Stacie began creating with zippers in 2005 after her Mother came back from a trip out West with a zipper heart pin she had purchased. Using the bought piece as inspiration, she started with her Grandmother’s zipper collection and quickly made the craft her own. She begins with whole zippers and cuts the fabric tape off, standing them up or flipping them on to their sides to be glued to a wood base. She often describes the process of filling in the spaces as painting with zippers. "Vermont is my home, and I am surrounded by beautiful farmland and magical woods. My studio is cradled in the Champlain Valley, bordered by the Green Mountains on the east and beautiful Lake Champlain on the west. Being able to create here surrounded by this natural beauty feeds me in a way that I cannot explain." Kathy Mitchell creates one-of-a-kind jewelry using sterling silver, nu-gold, and copper. Each piece is made from raw materials in sheet and wire form using hand held tools. A recent line of her work involves her use of reclaimed ivory piano keys from a one hundred year old church piano. 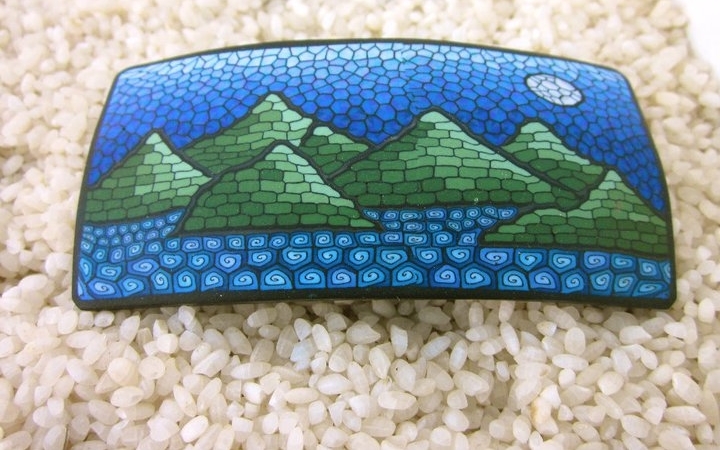 Combining scrimshaw and metal, she creates wearable art from this precious salvaged material." I grew up in New England in the land of cow pastures and orchards, running on the beaches of Cape Cod. I was the little girl who sat in my back yard smashing small rocks with a larger rock until they would crack apart hoping for a brilliant gemstone to come popping out. 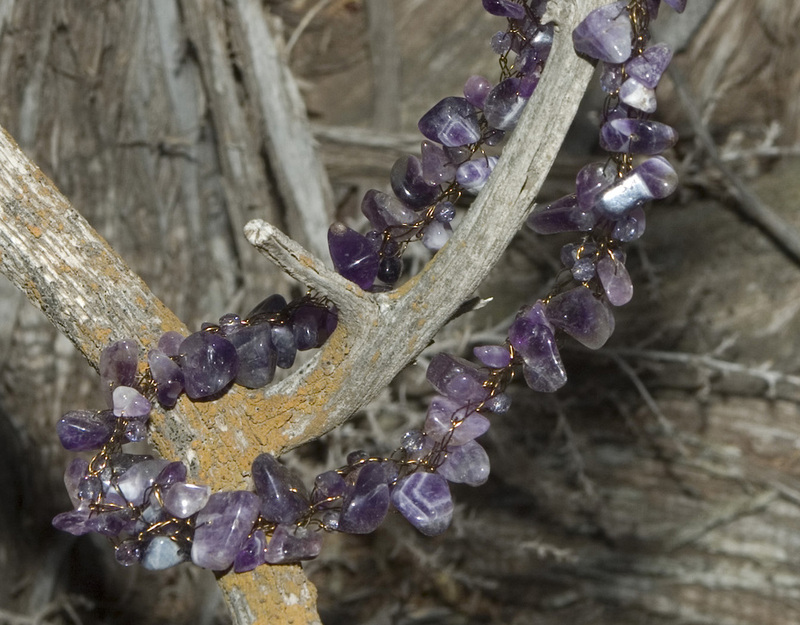 Sometimes I would find a treasured garnet crystal growing from the granite or a large sliver of mica shining in the sun, but the beautiful faceted jewels I dreamed of never appeared. I thought I wanted to be a geologist, but I didn’t. I really just wanted to play with the pretty stones. Fortunately many years later, after studying jewelry design in college and beyond, I found the art of lapidary. I apprenticed with a lapidary artist & learned the magic of turning a dull rock into a polished stone. I loved these finished works of art. I loved them so much that I had a hard time setting them into jewelry. They were just too magnificent all by themselves. This was a dilemma I had for many years until I learned the technique of wire crochet. Finally, it’s all about the stones! My line of wire crochet necklaces, bracelets & barrettes mix natural gemstones, dyed freshwater pearls and crystal accent beads into a magical blend of earth & ocean. It’s all about the colors and the organic blending of all the elements for me… and, of course, the stones. Gina's jewelry is as unique as the women who wear it. As a native Vermonter, born and raised in the the Northeast Kingdom, Gina still views the natural beauty of the Green Mountains as if seeing it for the first time. This beauty inspires her to create; giving a blank metal canvas new texture, color and form with an organic feel and rustic charm. You can feel the connection between the contemporary and the ancient in his designs. When you wear a piece of Lochlin's, it seems to complete you in such a unique way, becoming a part of you. This imaginative work is a staple in the jewelry collections of those who are fortunate enough to own it. Susan Heston Simpson first encountered trade beads when a bead trader came by her house in the city of Bouake, in the Ivory Coast, West Africa. The trader dumped all of his beads on the veranda table and it was truly a feast for the eyes -- glass beads of unimaginable variety, created by artisans a hundred years earlier, full of fascinating histories and travels. Since then, at home and in her spare time, she has been forging a new life for both antique and vintage trade beads -- inviting them back into circulation as parts of earrings, bracelets, necklaces and barrettes. She first began showing her work while living in Michigan, through periodic open houses and art fairs, to finally showing in a local art gallery. She returned to Vermont in 2011 to pursue a second Masters degree. Now, the bulk of her time is spent in the public school system, where she teaches English as a Second Language.